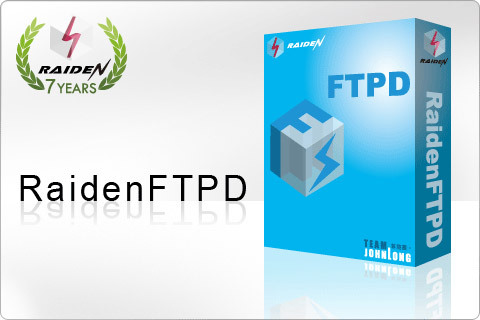 FTP Server software - RaidenFTPD is an easy-to-use FTP Server daemon for Windows?. With this handy FTP Server tool you can share your files with friends, provide file download services to customers or even setup your own home network FTP server. Not only are all the basic FTP features built-in; it also features various advanced features such as SSL/TLS, UTF8(unicode), UPnP NAT traversal and more ..
GUI based user interface - tired of using command line or text editor to manage Your servers? RaidenFTPD has easy-to-use management consoles including server options, user account management, virtual file system management, ip access restrictions, server schedulers and even the remote control interface. Full range operating system support - RaidenFTPD supports Windows98/ME/2000-2008/XP/Vista/Win7. It also can run as a standalone application or system service, Under newer Windows operating systems such as Windows XP and 2003, it can also configure Windows Firewall and UPnP routers automatically. Qweas is providing links to RaidenFTPD FTP Server 2.4.3913 as a courtesy, and makes no representations regarding RaidenFTPD FTP Server or any other applications or any information related thereto. Any questions, complaints or claims regarding this application RaidenFTPD FTP Server 2.4.3913 must be directed to the appropriate software vendor. You may click the publisher link of RaidenFTPD FTP Server on the top of this page to get more details about the vendor.